Five Star Rating lets you both quickly see the strongest aspects in your relationship based on real natal birth chart astrology. We use the most accurate individual chart based astrological synastry between you as a couple and highlight the strength of the aspects. Up to 50 pages in length, depending on the nature of the relationship between the two of you. If either partner is unsure of birth time, the reading could typically run between 10 and 20 pages. These are substantial, in-depth astrology reports. Premium personalized natal horoscope chart/synastry analysis for couples at this price is a GREAT value, and you will enjoy no doubt seeing some things you already know about your partner as well as others you may not! We're confident each partner will recognize aspects of themselves and the other in their love relationship. Reading your couple's personal astrology reading together is time well invested in your relationship! 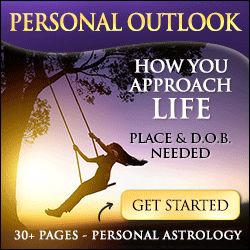 Get even more personalized astrology predictions, individual natal chart readings, predictions, scopes and soul guides to your future. These premium astrology reports are the most accurate personal horoscope for 2019.